Well, what do you know... this little blog turns 1 today! I can't believe it's been a year. AoaAF has underwent a lot of changes since the old days. Many thanks to all of you who stop by my little corner of the interweb! Switching to a sad note, my friend Tirrone is leaving for Illinois very soon and we wanted to send him off with a good meal and good friends. To keep things simple for a busy cooking weekend, we decided on a BBQ, with homemade hamburgers and chicken-apple sausages. 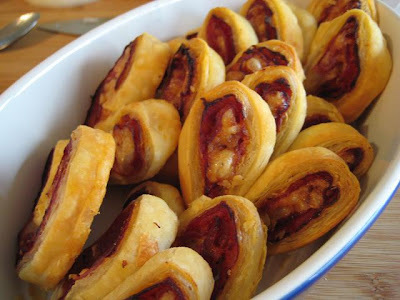 One of our appetizers was prosciutto palmiers, a recipe from Chow. 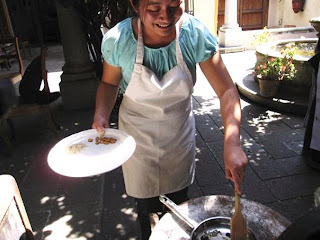 It's a quick recipe that produces large quantities, which makes it perfect for larger groups. I've changed the recipe slightly and, next time, I'd like to use an egg wash to give the puff pastry a little shine and some extra moisture. On a floured surface, roll out each puff pastry to a rectangle of approximately 9 x 13 inches. Try to keep the edges even and trim if necessary. In a bowl, stir together tomato paste and water until smooth. The paste must be easily spreadable. Using the back of a spoon, spread half of the tomato paste mixture on to each pastry rectangle. Arrange slices of prosciutto on the paste, overlapping slightly. Sprinkle cheese evenly over prosciutto. Roll long edges of rectangle towards the center, so the folds look like window shutters. Fold the halves together, so the roll forms "elephant ears". Wrap with plastic wrap and place in the freezer for 5 minutes. Remove from the freezer, make sure the roll is firm, then slice off the ends (discard the ends). Cut the roll into 1/2 inch slices and arrange on a baking sheet, keeping them about 2 inches apart. Brush lightly with egg wash, then bake for 15-20 minutes or until golden brown. Cool until safe to handle. Best served warm. Tirrone also requested a tiramisu, for which I dug out an old and very faithful recipe. 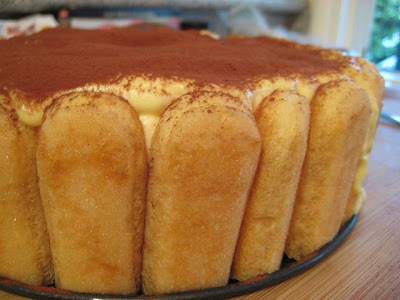 I grew up during the tiramisu boom of the 90's, when every restaurant had their own version. I love the stuff and wanted to make my own, so I found this recipe during my third year of college. I even won a dessert contest at work with it. In a double boiler, combine egg yolks and sugar. Over low heat, whisk constantly for about 10 minutes. Remove from heat and continue whisking until yolks are thick and a very light yellow. Add mascarpone and beat until combined. In a separate bowl, whip cream to stiff peaks. Gently fold into yolk mixture and set aside. Trim ladyfingers to size for lining a 9-inch springform pan. Dip each ladyfinger lightly and quickly in the coffee liqueur and neatly line the pan. Add 1/3 of the filling over the bottom layer, then line another layer of ladyfingers on top. Repeat once more, then add the remaining 1/3 filling to top off the pan. Dust top with cocoa powder and chill overnight. Bon voyage to Tirrone and here's to another year of great eating! Congrats on your Blogger-versary GF! Here's to many, many more years of good eating! What a great way to send off your friend, those desserts are just elegant! How lucky he is to have a friend and wonderful baker like you! those prosciutto palmiers look delicious! now i'm inspired to make it!